Car themed set for boy's Greek Orthodox Christening. Handmade with gray and graystriped fabrics. 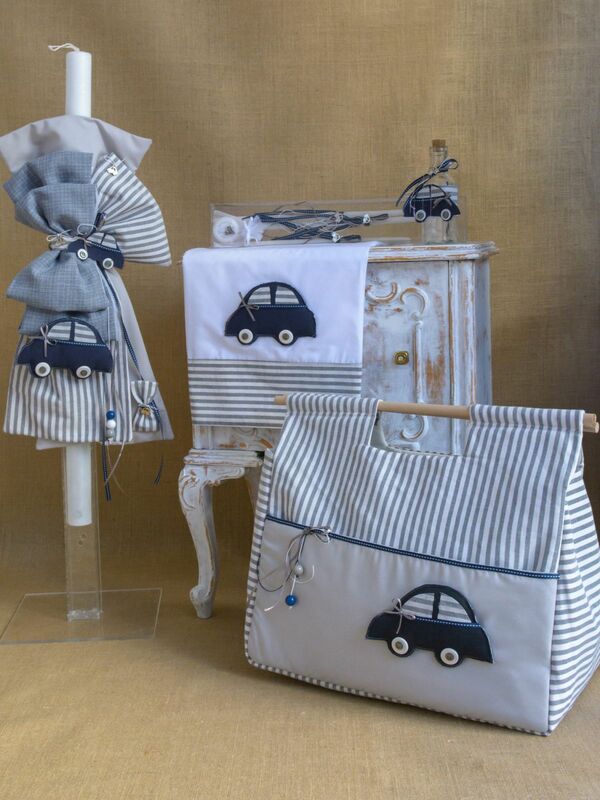 All the set, lampada, ladopana, oil bottle and large bag has been decorated with fabric cars in dark blue color, and small metal cars. All these embelished with three color beads tied with chic satin ribbons. The set includes the lampada, ladopana (chrisomes), large bag, three candles, oil bottle, soap, underwear and towels. Items can also be purchased individually. https://www.preciousandpretty.com/2017/03/car-themed-greek-orthodox-baptism-lampada-set-CSB30.html Greek Wedding Favors|Orthodox Crowns|Stefana|Baptism Invitations Car themed Greek Orthodox Baptism lampada set CSB30 Car themed Greek Orthodox Baptism lampada set. Product #: Greek Wedding Favors|Orthodox Crowns|Stefana|Baptism Invitations_9055866178110004532 5 stars out of 5 reviews.